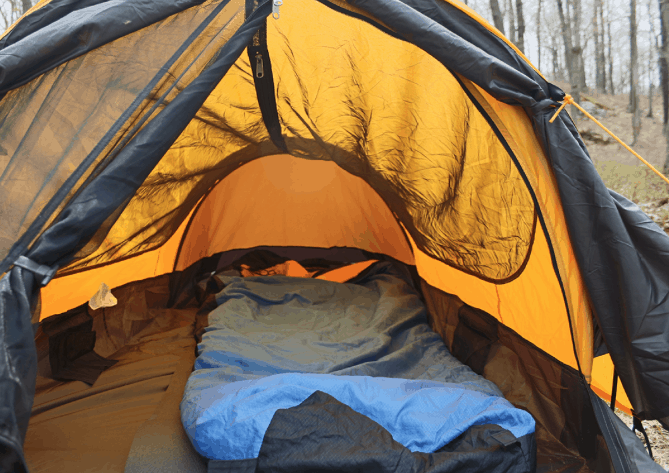 » Eureka Solitaire Review: Is this the Best Tent For You? 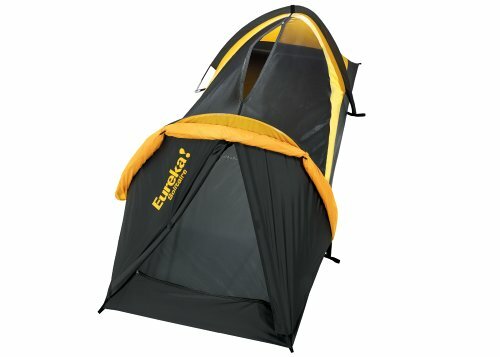 Eureka Solitaire Review: Is this the Best Tent For You? There are so many tent options out there that it can be dizzying to narrow them down. When it comes to solo camping, though, especially for backpackers who have to consider weight and pack size, smaller tents are undoubtedly better. In this article, we’re going to tell you about the Eureka Solitaire tent, explaining how to set it up, detailing its features and then giving you brief pros and cons section to sum everything up. You can use this one-person, bivy-style, 3-season camping tent during the spring, summer, and fall. A bivy shelter (short for “bivouac”) is a small, lightweight shelter with just enough room for one person. The Solitaire is super easy to pitch, and it’s a fantastic tent for new backpackers or campers who need something durable and functional, who don’t have a big budget, and who need to carry their shelter on their back. The Solitaire has an inner net tent with a waterproof floor and an outer rain fly. However, unlike most other double-walled tents, the inner net tent and the outer rain fly are attached on the Eureka Solitaire, meaning they’ll also be erected simultaneously. This is helpful for newbie campers who aren’t very experienced in setting up a tent. Additionally, this unique style of pitching means that you can put the tent up in the rain without getting the inner tent wet. When you set up the tent, the best technique is to start by laying it on the ground, then inserting the poles in order to give the tent some structure. Both poles are shock-corded and can be inserted into the fabric sleeves on the outer rain fly. The ends will slot into the side grommets that are sewn into the floor of the tent. When you have the poles locked in place, it’s time to stake the bottom inner tent and the outer rain fly. Shock cord is used to make the small loops for the tie-outs. For most people, set up takes between 5-7 minutes. In this section, we’re going to talk in depth about everything from the tent’s access points and ventilation options to its interior space and how well it holds up in the wind. We mentioned it quickly, but we want to reiterate that this is a 3-season tent and should not be used during the winter. The roof can easily accumulate snow, which could make it cave in. There are much better winter-ready bivy shelters for more extreme conditions. The right side of the tent and the front of the vestibule has a double-sided zipper that will open up the screened-in area, allowing you to enter here. This front door zipper has extra protection thanks to a storm flap with Velcro tabs. To crawl in this opening, you’ll need to go feet first, which can be difficult (this is common in bivy shelters). Since the tent doesn’t have enough space for you to turn around and sleep in the other direction, you’ll have to sleep in the direction that you climbed into the tent. When you have the outer rain fly rolled back, you can use the second entrance on the top of the tent to enter and exit. There’s a double-sided zipper on the top of the inner tent that lets you step in and out of the tent. If it’s raining, though, you won’t want to roll back the rain fly in order to access this top entry point. The tent poles for the Eureka Solitaire are on the short side, so you may not be able to sit up straight in the tent – the peak height is 28 inches. This is pretty common in a bivy tent, but it can get problematic if you have to spend an extended period of time in the tent, like during a bout of bad weather. There is, however, a lot of floor surface – the floor size inside the tent is 32×96 inches, which is pretty big for a bivy shelter. There are two low areas on the ends that are approximately 5 square feet each. These areas make good vestibules for storing gear, especially if you’re going to be using the top entrance and don’t need access to the front entrance. Without the two vestibule extensions, the sleeping area of the tent is 16 square feet. While different sleeping configurations may limit how much you can use the vestibules, there’s a lot of interior room in the tent in order to store your backpack and other items on either side of your sleep system. The Eureka Solitaire comes with fiberglass tent poles that have been known to break easily. To combat this and avoid a problem mid-trip, consider replacing the fiberglass poles with aluminum poles. TentPole Technologies makes replacement poles, or you can order the Eureka Solitaire from the Amazon’s Canadian site, which comes with aluminum poles instead of fiberglass. The Eureka Solitaire comes with 12 steel shepherd’s hook stakes (plus a plastic one), weighing in at a whopping 8.4 ounces – and you need the full dozen in order to pitch the tent. Many campers opt to replace these stakes with lighter weight options, such as titanium shepherd’s hook stakes, weighing in 2 ounces each. Once you have the tent pitched (we got into setup below), you can adjust ventilation. The best way to increase ventilation is to roll back the rain fly (the rain fly itself doesn’t have any vents) over the screened-in vestibule on the front of the tent. The fly is opened by releasing the corner bungee cords, undoing the Velcro connection on the rear loop, and then rolling the fly towards the front pole, where you can lock it in place. You can then open up the vestibule more by rolling the doors open, so they become flush with the top pole. To sleep, your head will be positioned in front of this pole and inside the front vestibule. However, while this configuration will be fine during a dry night when there isn’t any dew in the morning, it could be problematic if it rains or if a lot of dew builds up overnight, since you’ll be leaving your head exposed. If you’re not able to roll back that fly for ventilation via the front vestibule, the tent can get pretty warm. While how warm you’ll get (or if you get warm at all) also depends on the humidity, precipitation, and temperature, the side mesh windows of the inner tent don’t allow for the airflow to keep you fresh, especially without steady wind. While you won’t get soaked during a summer rainstorm thanks to the double-walled nature of the tent, it could become unbearably hot and humid inside. If you’re planning to camp in an area that experiences a lot of humidity, heat, and rain, this isn’t the best tent choice. 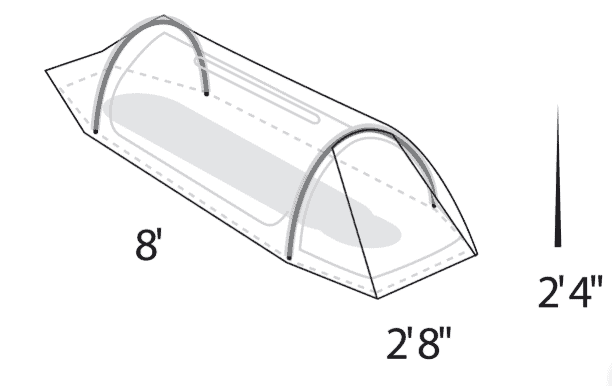 The trail weight of this tent is listed as 2 pounds and 10 ounces. However, this weight is a bit misleading since it only refers to the weight of the tent and the fly, not the poles and stakes. Since this isn’t a freestanding tent, you’ll need the poles and stakes in order to pitch it. By adding everything together, the weight is approximately 2 pounds and 19 ounces. By replacing the stakes with lightweight alternatives, you can cut down on this weight. Overall, this is still a lightweight tent, and an inexpensive one compared to similar tents. It also has innovative features that some similar tents at higher price points don’t have. Since this tent has a shock cord instead of fixed lines, you won’t be able to get an extra-taught pitch. If you expect wind and need a tight pitch, it’s possible to replace the shock cord with fixed guylines. Overall, though, this isn’t an excellent tent for windy conditions, especially if you’re expensing high winds, you’ll be in a high altitude, or you’ll be above the tree line. We’ve covered a lot in this article, so we thought it’d be helpful to include a succinct list of the Solitaire’s pros and cons. The Eureka Solitaire tent has a surprising amount of features for the low price tag, including the double-walled structure, extra interior room, front vestibule and convertible mesh roof that allows for stargazing. It’s also rugged enough to handle a thru-hike and it doesn’t require much space at all to get it all set up. While pro campers will want something more advanced, the Solitaire is an excellent option for newbie solo campers who have to set up camp wherever possible. Yes, the Eureka Solitaire has limitations, but when it comes to the value for the money you’ll spend, it’s hard to beat it. 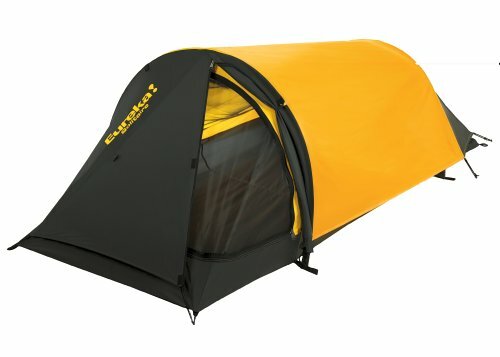 It’s a fantastic starter tent that you can upgrade from in the future and always keep as a backup.